determination, drive and to quote ESPN Larry Schwartz, “an indomitable spirit.” He’s had more comebacks than most, and with good reason: he never gave up. He simply went the extra distance and gave tennis his all. 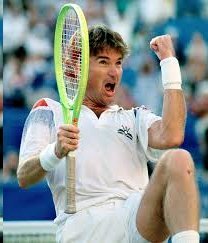 Even at age 39, when most athletes are golfing with movie stars, or endorsing something, Ol Jimmy was busy at the 1991 US Open, taking on a much younger Paul Haarhuis. Connors was on the verge of going down two sets to none, but he broke Haarhuis’ serve, then his spirit giving him a 4-6, 7-6, 6-4, 6-2 victory. Connors explains ” There’s always somebody out there who’s willing to push it that extra inch, or mile, and that was me.” So every time you feel that it’s time to throw in the towel, that you’re totally spent, that you simply have no more in you, that’s when you have to refortify yourself and trudge ahead. And remember, you’re in the company of greatness. Posted 5 years ago by aviciment.